Lord God, to whom belongs all creation, and who call us to serve you by caring for the gifts that surround us, inspire us by the example of Saint Isidore to share our food with the hungry and to work for the salvation of all people. Through our Lord Jesus Christ, your Son, who lives and reigns with you in the unity of the Holy Spirit, one God, for ever and ever. A Spiritual and Material Mission to Rural America | The Most Reverend Edwin V. O'Hara D.D. Manifesto on Rural Life | Bishop Aloisius J. Muench D.D. Partnership with God: Christ Glorified in the Sacrifice of the Farmer | Bishop Aloisius J. Muench D.D. 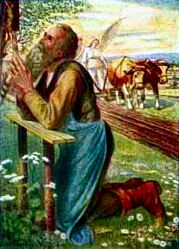 Prayers for Farmers | John Hennig M.A. The Land and the Spirit | The Most Reverend Peter W. Bartholome D.D. Isidore was a Spanish laborer who worked most of his life as a ploughman for a nobleman who lived near Madrid, Spain. Although working many hours a day, he never failed to attend daily Mass, and spend time praying before the Holy Eucharist. 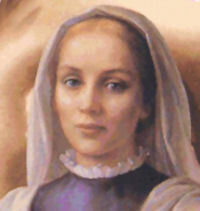 He married a maid-servant, Maria de la Cabeza, who was also canonized a saint. They were always willing to help their neighbors and worked with the poor in the city slums. In 1947, he was proclaimed the Patron of the National Rural Life Conference in the United States. According to the 1962 Missal of Bl. John XXIII the Extraordinary Form of the Roman Rite, today is the feast of St. John Baptist de la Salle. He was inspired by God to give a Christian education to the poor, he founded the Brothers of the Christan Schools which soon spread throughout the world. In private life he treated himself with extreme rigor. He died in 1719. His feast in the Ordinary Form of the Roman Rite is celebrated on April 7. Historically today is the feast of St. Dymphna, the daughter of a pagan Celtic chieftain and a Christian. She fled from home on the death of her mother to escape the incestuous interest of her father and went to Antwerp accompanied by her confessor, St. Gerebernus, and two companions. They then built an oratory at Gheel where they lived as hermits. Tracked down by Dymphna's father, the two companions and the priest were murdered by his men, and Dymphna was beheaded by her father when she refused to return with him. When he was barely old enough to wield a hoe, Isidore entered the service of John de Vergas, a wealthy landowner from Madrid, and worked faithfully on his estate outside the city for the rest of his life. He married a young woman as simple and upright as himself who also became a saint-Maria de la Cabeza. They had one son, who died as a child. He was known for his love of the poor, and there are accounts of Isidore's supplying them miraculously with food. He had a great concern for the proper treatment of animals. He died May 15, 1130, and was declared a saint in 1622 with Ignatius of Loyola, Francis Xavier, Teresa of Avila and Philip Neri. Together, the group is known in Spain as "the five saints." Patron: Farmers; farm workers; ranchers; rural communities; Madrid, Spain; National Catholic Rural Life Conference in the United States; death of children; for rain; livestock. Symbols: White oxen; spade; hoe or rake; plough. 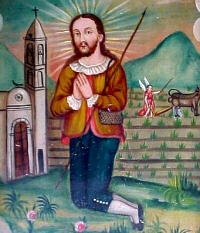 Learn more about St. Isidore the farmer. Establishing or replenishing a a Mary garden would be an appropriate way to celebrate the combination of the feast of St. Isidore and the month of May, dedicated to Mary. Visit mgardens.org to learn more about Mary Gardens. There is also a lovely book on Mary gardens printed by St. Anthony Messenger Press called Mary's Flowers: Gardens, Legends and Meditations by Vincenzina Krymow. Another book by Vincenzina Krymow is Healing Plants of the Bible which explains Biblical gardens and plants. Daughter of a pagan Irish chieftain named Damon, and a beautiful devoted Christian woman whose name has not come down to us. Her mother died when Dymphna was a teenager. Her father searched the Western world for a woman to replace his wife, but none could. Returning home, he saw that his daughter was as beautiful as her mother, and maddened by grief, he made advances on her. She fought him off, then fled to Belgium with Saint Gerebernus, an elderly priest and family friend. Dymphna’s father searched for them, and his search led to Belgium. There an innkeeper refused to accept his money, knowing it was difficult to exchange. This told Damon that his daughter was close - it would be unusual for a village innkeeper to know a lot about foreign currency, and his knowledge indicated that had recently seen it. The king concentrated his search in the area. When he found them in Gheel, he beheaded Gerebernus, and demanded that Dymphna surrender to him. She refused, and he killed her in a rage. The site where she died is known for its miraculous healings of the insane and possessed. There is now a well-known institution on the site, and her relics are reported to cure insanity and epilepsy. Vist the National Shrine of St. Dymphna. Say the Chaplet of St. Dymphna. You can read this life of St. Dymphna and join the Franciscans in a novena to the saint.